As I mentioned in this post last week, I am very excited to be starting a new blogging venture with five other Western Australian-based authors. Each month, we will all simultaneously post the answer to a question often asked by readers. After all, six brains are better than one! This is the first post, which deals with our writing process. I’ve been fascinated to read the other posts, and you can find links to them at the bottom of this page. Starting a new project is always exciting. It is the moment when anything is possible. The ideas I have for the book have not yet been tried out, and the book exists in my head as a perfect thing. This is it, I think to myself, this will be the best thing I ever do. The trigger point for this book wasn’t the war itself, but the idea of war photography as a profession. What kind of person is attracted to this job? How do you juggle being an observer in a horrific situation when your knee-jerk reaction might be to help or flee? Does what you see and the exposure to fear affect your psychology and home life? The details of war itself, I have little interest in. So I spent a lot of time googling guns, ammo and helicopters: printing out and labelling pictures to remind myself. I decided to set the book in Vietnam as it is the only war where censorship of photography and journalism was limited. If you had a press pass, you could basically travel anywhere in the war zone. The editors in New York or London might change your story, but they couldn’t change the photographs. Photography was also instrumental in altering the course of the war: once people saw the photos in the US and overseas, they begin the protests of the late 1960s and early 1970s. I had never been to Vietnam and knew nothing about the American war there. I also knew nothing about the history and culture. As well as book and internet research, this involved visiting the country for extended periods, and talking to survivors of the war. One of the best things I have ever done. I can take photos: with my digital camera. And even those aren’t very good. In the 1960s, the most common cameras used by war photographers were Leicas or Nikon Fs. Manual cameras, where you set the aperture and shutter speed yourself. I had to learn how to do this. And what these strange words even meant. You are probably thinking I must be crazy to make things so difficult for myself. That’s what I’m thinking, having just written down what I started with. But this is what I love about writing: the challenge of imagining I am someone else, who has had wildly different experiences. Can I do it? I guess we’ll see.When I began the project a year ago, I took a deep breath, and before I wrote a word, I looked at each aspect I knew nothing about, and I worked on educating myself. I bought a camera and got my friend to teach me to use it. I went to Vietnam. Twice. I read a trillion books, fiction and non-fiction, some of which are shown above. 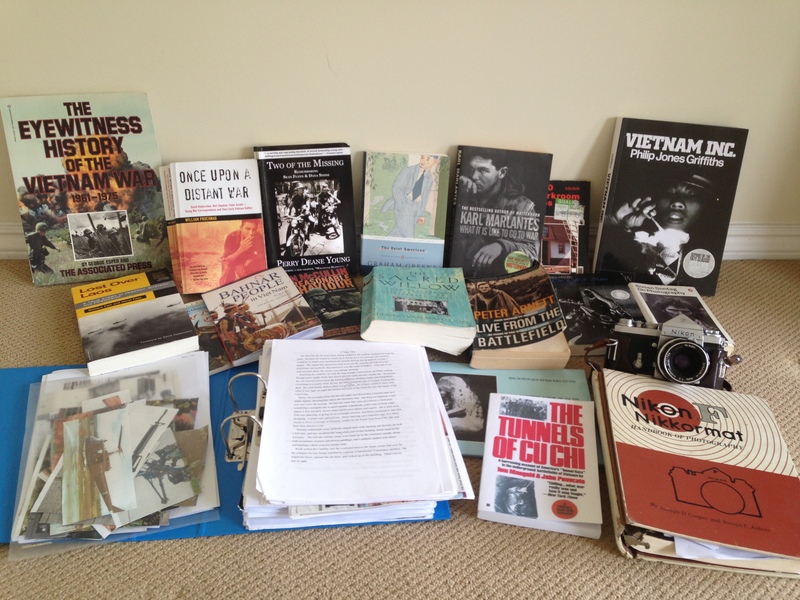 Memoirs of soldiers and journalists, Vietnamese literature and sociology, books on photography, about the war. Anything and everything I could get my hands on. I watched every Vietnam film. I ‘researched’ the 1960s by watching Mad Men, James Bond, and anything set in London. I printed out photos and pinned them on noticeboards. But you’re a WRITER…when did you write? I only began writing when I had that moment, that strange feeling: I’m ready. It was only after I had done enough research on a particular area that I felt ready. And even then, when I sat down at my computer, I was terrified. What if what came out wasn’t good enough? I had to quiet down that critical voice (for now!) and remind myself that I was doing this for me, and that I love it.After a year of researching and writing chunks in alternating stages, I now have a rough first draft. Carried-around-in-the-dog’s-mouth scrappy. But at least it’s a real thing, on paper: evidence of thinking and reading and watching and mulling. Now that I have a skeleton, I am beginning the editing process. That critical voice which tried to shout out at every turn of the writing process? Now’s the time when I stop ignoring it and listen. I imagine I am looking at the book through the eyes of someone I admire: a favourite writer or my agent, and ask myself what they would say about each scene, each sentence. I look at the structure and play around with when to relay what information to the reader. What is this scene trying to achieve? How could that sentence be better? I look out for repetition (which my short memory lets in), clichés, overuse of adjectives and adverbs. I strip the book down to what needs to be there, not what I needed to write to imagine it. Whilst writing, the book belongs to me and me alone. Once I have meticulously edited it, I will release it into the world. By which I mean send it to my agent, not publish it. Letting even one other person see it, even someone I trust, is a scary moment. When I did it with How To Be A Good Wife, I remember going to King’s Park and lying on the grass, reminding myself over and over that this was just the beginning, and that I needed help for the next stage. Sending the book to someone you trust, who knows their stuff, is very important. When you can’t think of anything else to do with the book, except for maybe burn it, you need their help. An outside influence can work wonders: they ask the right questions and put you back on the right track. For How To Be A Good Wife, we did two and a half huge edits over two years. After a month or two, I receive pages of notes and line edits on every word, and then I get back to work. I’m hoping the process will be quicker this time after the experience of my last book, but I’m not expecting it to be. And then, once we had gone to publishers, I did another huge edit with my editor there. Again, having a new pair of eyes on the book was amazing. Without both my editor and my agent How To Be A Good Wife would not be the book it is today. You have to be in it for the long haul. The average book takes three years to write. I thought I would be able to do it faster. I was wrong. Keep faith. The hardest thing about writing is keeping going when it seems you are at it alone, or that nothing will ever come of it. Turn off the pressure. I put myself under a lot of pressure trying to get How To Be A Good Wife finished. As I was working full time, I had to fit it in before and after work, and that meant I had to be disciplined. This was important, but don’t drive yourself crazy. As my fiancé once reminded me, you are not a tap. Sometimes you can’t force it. Remember, always, that it is worth it in the end. Every moment of doubt I had while writing How To Be A Good Wife, every day when I thought it would come to nothing, when I had to wade back in for another edit even though I thought it was finished: every moment was worth it. Being published is as good as I imagined it would be: and that’s saying something! Great post. The amount of research you had to do before hand would have frightened most people off! You are not a tap! Amazing advice. It’s going on a post it and on my wall above my writing space. Attribution? Emma Chapman’s fiance. I think it’s brilliant that you immerse yourself in the research so completely. It’s one of the wonderful things about writing- you want to write about something, you first have to go and try it out, or try out as close as you can get. Do you ever find that it’s hard to approach people when you have questions about specific things in your research, like if you wanted to interview someone who had been in the same position as your character? I know!! I had been ranting on the phone to him, and I thought he was going to tell me to pull myself together. He listened quietly and just said that, and he totally hit the nail on the head. I definitely find it hard to ask the right questions, or sometimes any questions at all. You don’t want to make people uncomfortable. Luckily, in Vietnam I met many people who were open about their experiences of the war. I found them to be an open, honest people, and I really respected their ability to talk about difficult things that had happened in their past. I think it’s something we fail to do in the West: we have this idea we have to be perfect and admitting fault is a weakness. Being there taught me a lot. Thanks Kerrie! Writing it all down for this post made me realise how much I actually did, which you don’t necessarily notice day by day. I feel uncomfortable not researching when I’m writing about an experience so far away from my own.